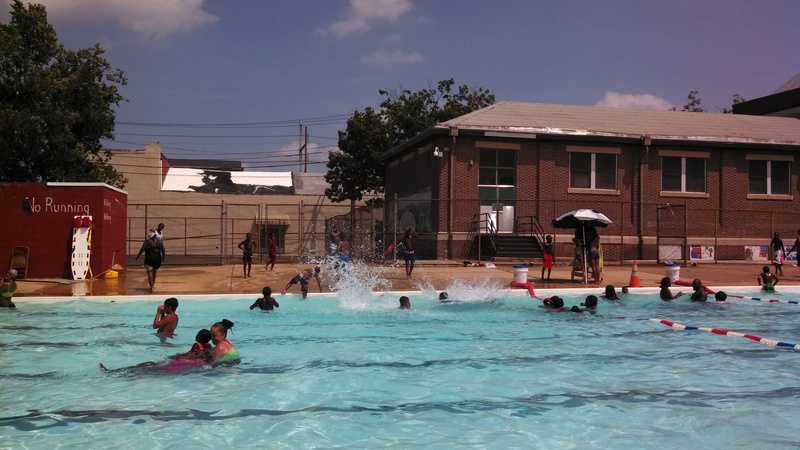 South Philly’s largest public swim spot, Vare’s pristine waters sparkle between a century-old rec center and its adjacent expanse of threadbare fields. People who’ve been around for a while sometimes refer to the pool as “Gray’s Ferry” for the surrounding neighborhood, a blue-collar community hit hard by deindustrialization and often defined – at least externally – by racism. Originally built around 1925, the pool (which has been rebuilt since) was in a white section of the neighborhood and did not start integrating until the late 1970s/early 1980s. In response to some particularly scrutinized area incidents of racial violence in 1997, the City committed to funding programming and renovations at nearby recreation facilities – which were both sites of conflict between Irish-Americans and African-Americans, and sites with particular potential for reconciliation and community-building. That commitment included valiant measures to keep Vare’s pool open, including fully or partially draining its 75,000 gallons every night during pool season (to be able to clean up bottles that were thrown in the pool to keep Black swimmers out) and equipping Vare with the largest police presence of any pool in the city. Vare’s pool still gets drained every night (although I’ve heard now that’s more to keep people from swimming than to clean up hate-fueled debris), and the regular circulation means it’s got some of the freshest swimming water in the city. Its size and shape make it perfect for laps, though when I’ve visited jumps and flips seem to be more common. Vare Playground occupies the block between Morris and Moore and 26th and 27th; the pool is on the Morris Street side. This entry was posted in Uncategorized and tagged Pools, South Philly by Mica Root. Bookmark the permalink. Pretty sure they’re draining that pool to still clean out bottles and trash. I grew up swimming in that pool and it was NEVER drained to keep people from swimming at night. That is absurd. They only partially drain it, though, which wouldn’t be that much help in terms of sweeping out broken glass… What was the pool like when you were growing up, Michele? Used to go every other day, girls swim,, they may have kept most glass out of the pool, but that was the worst area to walk without shoes on any sidewalk or court nearby!